Keeping your yard free and clear of debris is a great way to have your home look great through all the seasons. During the fall months, you may find that you’re overwhelmed by leaves which can dry out your lawn and cause hazards for you and your family. One of the best ways to ensure that you can quickly and efficiently clear your yard is to use a lawn sweeper. Not only will this help you to keep your lawn looking nice, but you will increase the health of your grass by keeping it moist and allowing sunlight to invigorate it. A lawn sweeper is a simple device that is pulled behind your lawn mower or tractor to collect the leaves and debris that are created when you mow your lawn. The carrying capacity of a lawn sweeper means that you can easily remove unwanted leaves, grass and small twigs and sticks easily and with a higher efficiency than when you use a rake. Lawn sweepers work by using a series of sweeping brushes that rotate across your grass as you pull it along. The mechanical action of the sweeper brushes means that leaves and other small debris get pulled up and swept into a collection bag. All you need to do then is to empty the collected debris into your trash or compost pile. Keeping your lawn clean and tidy may seem like a challenge, but with the Brinly tow behind lawn sweeper, it’s easy remove dead leaves and debris so you can get your lawns looking perfect again. This robust sweeper contains many features that make clean up a breeze. We know that you want the ability to tailor your lawn sweeper to meet your specific needs each time you work. The Brinly lawn sweeper features six high-velocity brushes with an indexed brush height adjustment so that it’s possible to tackle any type of terrain with ease. When you’re not using your lawn sweeper, having it sit in your barn or garage will see you taking up a lot of unnecessary space. The Brinly is perfect for space-conscious people because it features an innovative compact storage design that allows you to store it conveniently and out of the way. There’s nothing worse than spending hours of your time cleaning up debris from your lawn. The Brinly lawn sweeper features a wider design that means that you don’t have to make as many passes across your yard to pick everything up, freeing up your time for the things you love doing. If you’re looking for a beast of a lawn sweeper, look no further. The Agri-Fab 44-inch lawn sweeper will see you getting around your lawn quickly and efficiently, leaving absolutely nothing behind. The most inconvenient step in using a lawn sweeper is having to empty it when it becomes full. The Agri-Fab lawn sweeper features an innovative flow-through design that allows the bin to fill up more completely than similar models. This way, you’ll get more of your lawn clear before having to empty it. 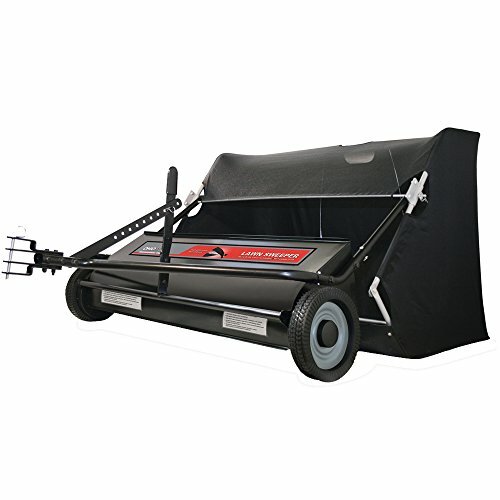 Though the Agri-Fab lawn sweeper may be bigger from most, you won’t be looking for large spaces in which to store it. The versatile folding design means that it has a smaller storage footprint, collapsing conveniently to store in smaller spaces. Don’t spend hours making several passes on your lawn when you want to cut and sweep. The Agri-Fab lawn sweeper features an adjustable sweeper tongue that allows you to do both at the same time, so that you are able to get your work finished without spending hours in the sun. Getting your smaller lawn cut means that you are able to work without heavy equipment like a tractor, instead using more traditional lawnmowers. The San Joe lawn sweeper is a versatile and robust design that gets your small lawn looking great again. 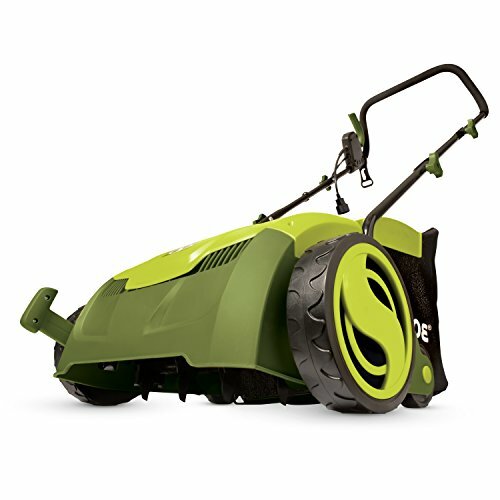 Cutting thicker grass can be a real drag, but with the Sun Joe system you’ll be able to cut through anything. The scarifier function means that it’s easy to power through lush and healthy grass to get the cutting power that you’d often need a more powerful model to get through. Don’t be fooled by the small design of this model. The Sun Joe system features airboost technology that allows you to efficiently pick up all of your cuttings immediately after you make them. The collection bag allows for maximum convenience to allow you to get your lawn clear from debris. Don’t spend hours getting your lawn cut and cleared. The Sun Joe lawn mower and dethatcher feature a wider frame to allow you a 12.6-inch path across your lawn with each pass. This makes for easily revitalize your small to medium sized yard with ease. Perfect for smaller or medium sized yards. Sometimes the best approach to clearing your lawn is the simplest. 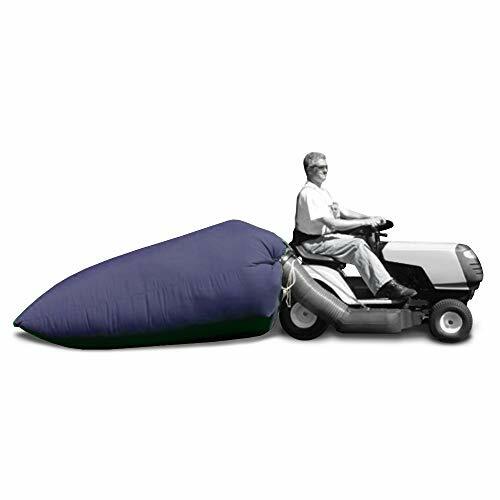 The Lawn Tractor Leaf Bag is one of the most basic designs, yet allows you to clear at the highest capacity. With easy-to-use features and comfort when collecting, you’ll be able to power through any lawn. What could be better than clearing more debris each time you mow your lawn? The lawn tractor leaf bag collects as high as two to three times more leaves and debris than your average model thanks to the unique yet simplistic design of the leaf bag. Collects up to 54 cubic feet. While the system may look basic, the lawn tractor leaf bag is built with durability and strength in mind. Made from polyester fabric and featuring two drawstring clips, the bag stays neatly and firmly attached to your tractor for efficient collection at all times. There’s only one step involved in using the lawn tractor leaf bag: just attach it and of you go. The system uses the powerful mechanism of air-flow to neatly and efficiently clear leaves in your path into the leaf bag, making it the most robust system yet. While tractors may be a convenient way to tow your lawn sweeper, they can be expensive and too large for the yard of a family home. Instead, you might consider using a push lawn sweeper. 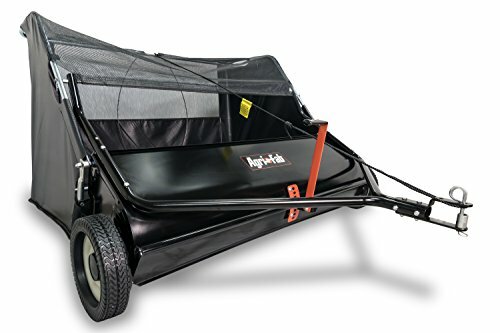 The Agri-Fab 26-inch Push Lawn Sweeper is designed for easy removal of yard debris in a convenient push style. The Agri-Fab push lawn sweeper is built in a lightweight design that is perfect for people of any age to use. The comfortable grip and durable body will ensure that your lawn sweeper delivers powerful performance every time. Many lawn sweepers require completely removing the hopper bag in order to empty your collected debris. 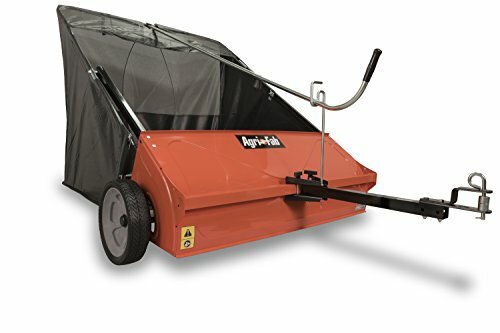 The Agri-Fab push lawn sweeper is designed to allow for easier emptying by featuring an intuitive disconnection of the bottom only so you can tip to empty with one hand. When not in use, your lawn sweeper can often take up a lot of space. 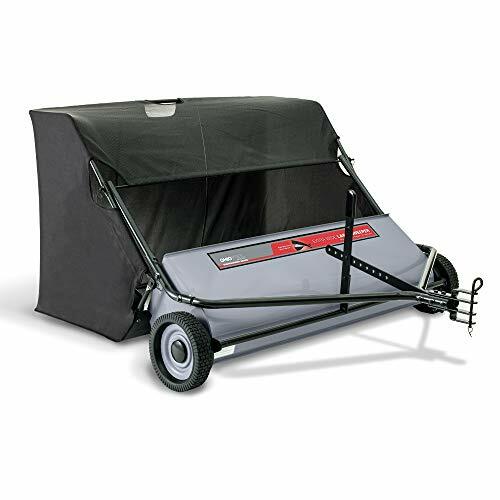 The Agri-Fab push lawn sweeper, however, is designed to be hung while stored, folding conveniently flat thanks to the flexible fabric of the bag. When strength and durability is your main concern, then nothing beats Agri-Fab. The Agri-Fab 42-inch Tow Lawn Sweeper is a smaller yet functional design that allows you to clear your average sized lawn with speed. No matter what type of tractor you have, the Agri-Fab tow lawn sweeper will fit. The universal hitch ensures that you can quickly attach your sweeper to your tractor no matter the configuration, making your job much easier. When it’s time to dump your debris, it’s best to have a lawn sweeper that makes the task simple. The Agri-Fab tow lawn sweeper is designed for just this. All you have to do is pull on a rope connection to dump the contents of the hopper. Rather than use separate brushes, the Agri-Fab tow lawn sweeper is fitted with a brush roller. The roller can be easily adjusted to your lawn height, and the tough and durable brushes will last for a long time. For a more professional level of sweeping in your own yard, the perfect solution requires a heavy-duty approach. The Ohio Steel Sweeper is a more efficient and easy to use alternative to regular lawn sweeper models. The Ohio Steel lawn sweeper features an exclusively patented brush that can sweep far better than other brush types. With a design that puts less pressure on the gears, you will experience a longer life with great results every time you use it. Using your lawn sweeper so often can mean that your brush height can slip over time due to the vibrations that are felt throughout the unit. The Ohio Steel lawn sweeper features a no-slip lock height that allows you to keep your adjustment settings exactly how you like them. Fitting your lawn sweeper to your tractor can be a difficult task if you require more than one height. The Ohio Steel lawn sweeper is built with an adjustable hitch that easily allows for multiple hitch heights in three positions. You’ve seen Agri-Fab on this list a few times now, and that’s because they make some of the best lawn sweepers you’ll find anywhere. The Agri-Fab Tow Behind Lawn Sweeper is no departure from this rule, and will enable you to sweep your lawn with ease. Why spend time looking for the perfect lawn sweeper only to find that it won’t fit to your tractor? The Agri-Fab tow behind lawn sweeper is designed with a universal hitch, so no matter what tractor you own, you’ll get a perfect fit every time. Most lawn sweepers only allow you to fill the hopper bag halfway before they’ll stop collecting more leaves. 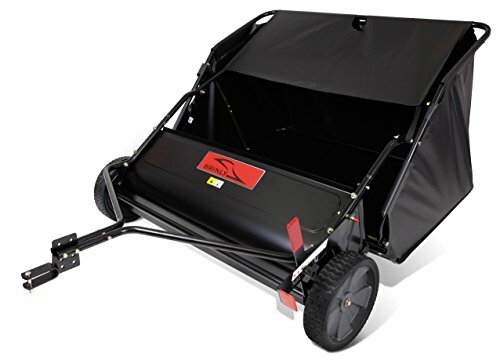 The Agri-Fab tow behind lawn sweeper features an innovative flow-through design that fills the bag completely before you need to dump. Getting through your lawn quickly means that you need to fuss less with dumping your collected debris. 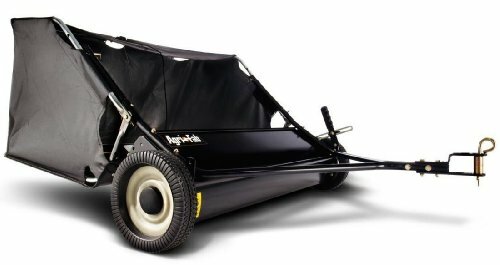 The Agri-Fab tow behind lawn sweeper makes it easy by allowing you to dump onto a tarp directly from your tractor seat. When you require strength when sweeping but the convenience of a foldable design, the Ohio Steel 42-inch Lawn Sweeper is the perfect offering. USA made and built with the heavy-duty design that enables you to power through the largest lawns, it is one of the most strong and efficient designs available. The Ohio Steel lawn sweeper features a 5-position adjustable hitch, allowing you to easily connect it to your tractor no matter the height. If you find yourself upgrading your tractor or replacing a faulty model, you’ll be able to hitch up your lawn sweeper easily despite the height difference. A heavy-duty lawn sweeper needs to be fitted with the toughest sweeper brushes. The Ohio Steel lawn sweeper is built with durable polypropylene brushes that can pick up the thickest of leaves and debris, making your work easier. One of the most common problems with lawn sweepers is the fact that they can clog. The Ohio Steel lawn sweeper is designed with a wider chute that reduces the risk of clogs so that you can get on with your work without frequent maintenance. If you’ve been looking for the most powerful sweeper on the market, nothing beats the Ohio Steel Pro Sweeper. While it may not be suited to smaller yards, taking on larger gardens is a breeze giving you extra time to focus on what you love. Ohio Steel are known for their patented spiral brushes, and this model utilizes these exquisitely. 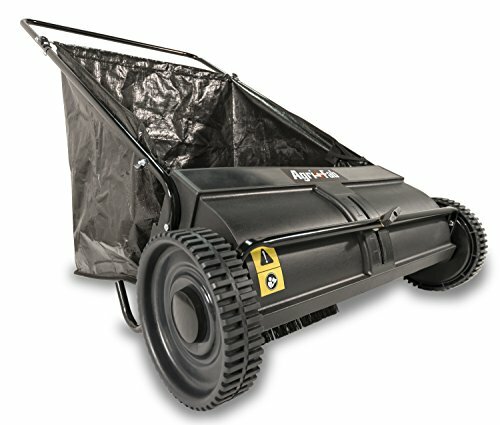 Built to pick up the thickest debris and easily allowing you to clear with speed and efficiency, this model will reduce the number of passes you make to produce clear and beautiful lawns. One of the most common disadvantages of any lawn sweeper is the complicated nature of assembly. However, the Ohio Steel pro sweeper is easy to build and can be done by just one person, so that you can get on with your work with ease. Clearing your lawn after rainfall or in the cool mist of the morning is a challenge for most lawn sweepers. The Ohio Steel pro sweeper, however, is a high powered offering that makes easy work out of any lawn no matter the weather. You might think that hopping on your tractor once your lawn sweeper is hooked up and driving around your yard is the only thing you need to do when clearing your unwanted debris. However, there are several steps that you can perform first to make the job far easier. Wearing thick gardening or work gloves, pick up large debris such as sticks, pinecones and rocks before you start. This will ensure even collection. Your lawn sweeper will perform far better if your lawn is freshly mowed. Longer grass can cause the brushes of your sweeper to work unexpectedly, leaving leaves and grass behind. The brushes on your sweeper need to be at the height of your grass. If they are too low, they will scrape along the dirt, picking up far more than you want, but if they are too high, they won’t be able to adequately pick up your targets. The most efficient way to sweep your lawn is to move in opposite directions at every turn. For example, you could work north to south or east to west, always overlapping slightly with your last path so that you don’t miss any spots. When you use your lawn sweeper regularly, then it’s important to keep it in good working order. You can perform routine maintenance on your lawn sweeper by checking it for loose parts before use, and by clearing out anything that may get stuck in the brushes or bag after use. Be sure to keep the wheel bearings and brush shafts lubricated if necessary. It’s easy to get more out of your lawn sweeper. Here are some intuitive tips and tricks that will see you using your sweeper for the most common issues you may face. Just because it does not fall, it doesn’t mean you can’t get full use of your lawn sweeper. Try clearing dirt and dust from your sidewalk or driveway by using your sweeper on the concrete. Or, if you experience a light snow, your sweeper is the perfect item to help you stay on top of it. If you’re finding yourself short on storage space then you should find a lawn sweeper model that can work with the space you have. A lot of sweeper systems feature collapsible designs that allow for easier storage in tight spaces. There’s nothing worse than pulling your lawn sweeper across your yard without it doing very much. The most common problem that people face is when they try to sweep a soggy lawn. The wetness of the leaves and debris make it hard for the brushes to efficiently pick up the debris, making your task far harder than it needs to be. As your sweeper is constantly moving across your lawn, it is essential to store it in a dry place so that you don’t run the risk of promoting the growth of mold and mildew. If moisture starts to build up, then you could be in for a smelly time. It is very important to stay safe when using a lawn sweeper. Here, we take you through the most important ways to ensure complete safety while you clear your lawn. Your main priority might be to ensure a clean area for your children to play in. However, when using your lawn sweeper, it’s essential to keep your children clear of the device because of the amount of moving parts that make your sweeper work. 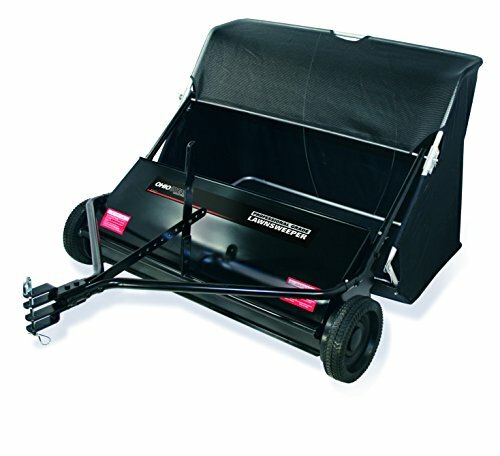 The mechanism of a lawn sweeper is to catch debris on the brushes before depositing it into the collection bag. That means that you may find that occasionally, twigs may shoot out from under the device. Wearing footwear will protect your feet from getting cut or injured. The easiest way to use a lawn sweeper is by pulling it behind your tractor. Not only does this make for easy work, but it allows you to use a larger sweeper that can clear more debris before the need to empty it. Never let your lawn sweeper touch your exhaust, as the heat can cause the plastic and fabric to melt or worse, cause a fire. Your lawn sweeper will be rated to carry a certain amount of debris. Check the user’s manual to find this limit and always work within it. Carrying too heavy a load will cause the system to overheat, which increases the risk of fire or breakdowns. Emptying your collection bag before storing is an essential step in using your lawn sweeper safely. Leaving leaves and dry grass in the bag can lead to unwanted combustion. Before you buy a lawn sweeper, consider the following important factors. If you have a large lawn, buying a larger capacity lawn sweeper will reduce your workload by removing the need to frequently empty the collection bag. Collection bags, or hoppers, are measured using cubic feet, and 20+ cubic feet is the perfect size for larger lawns. Your smaller yard may only require around 12 cubic feet, so choose carefully. The hitch connects your lawn sweeper to your mower or tractor, and choosing the right hitch type will ensure easy and effective use. The height of your mowing or towing equipment will determine the size and height of your hitch, and some may allow your sweeper to turn while others will keep it moving in a straight line only. The width of a lawn sweeper will ultimately determine how easily you can work. A wider sweeper will allow you to collect more leaves and debris on a single pass, but may not be suited to yards with an unconventional shape. Narrower sweepers will let you get easily into corners and around garden features. If you’ve used a push lawn mower, then you’re aware of how well they can be maneuvered across your lawn. However, a tractor may be the best way to get across your larger yard. Lawn sweepers are available in push or pull designs so you can choose the style that will make an easy job of your work. Q: How big of a lawn sweeper do I need? This is highly dependent on the size of your yard. If you have a bigger yard, opt for a wide lawn sweeper with a higher fill capacity. If your yard is on the smaller side, you might want to buy a lawn sweeper accordingly. Q: Will a lawn sweeper pick up pine needles? Yes. A lawn sweeper is very effective in picking up pine needles. Q: How do you empty the collection bag? Most models will incorporate a feature that allows for easy dumping of your collected leaves and grass. Just move the bag to a tarp, then activate the leaver to upend your collected debris into the tarp. Q: Do I need to mow my lawn before sweeping? It’s a good idea to mow your lawn first. This makes your grass even in length so that the brushes can work properly. Q: How high should I set the brushes? The brushes need to be set so that they reach the level of the grass, but no lower. This will ensure efficient collection of all debris. Which lawn sweeper did you like best? We love the Agri-Fab Tow Behind Lawn Sweeper (#8). For larger yards, there’s no better model thanks to the 26 cubic feet hopper capacity. We also love that the flow-through design means more efficient collection. A lawn sweeper is a robust and versatile tool that allows you to clear your lawn from leaves, debris and cut grass with ease. If you are fighting a war with your garden, adding a lawn sweeper to your maintenance collection will give you more free time to do the things you love.